WASHINGTON — Only 30 people were sentenced to death in the United States this year, the lowest number since the early 1970s and a further sign of the steady decline in use of the death penalty. The number is a sharp drop from the 49 death sentences last year and just a fraction of the peak of 315 in 1996, according to a report from the Death Penalty Information Center, a nonprofit organization that opposes capital punishment and tracks the issue. “I think we are watching a major political climate change concerning capital punishment and it’s reflected among reduced death sentences across the country,” said Robert Dunham, the group’s executive director. The growing reluctance of juries to sentence defendants to death is one of several factors contributing to the overall drop in executions. Twenty people were executed this year, the fewest since 1991, when 14 people were put to death. The high-water mark was in 1999, when there were 98 executions. Other factors leading to a drop in executions include shortages of the drugs needed to carry out lethal injection and more robust legal challenges by defendants in capital cases. 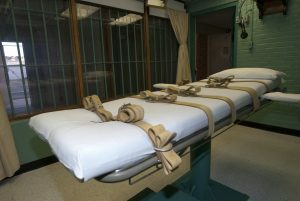 About half of Americans still support the death penalty according to a Pew Research Center poll earlier this year, but that is the lowest level in more than four decades. Public support for capital punishment peaked in the mid-1990s, when 80 percent of Americans favored it. Yet the issue still causes deep divisions. Voters in California and Nebraska declined to abolish the death penalty in their states when they considered referendums last month. And states like Ohio and Oklahoma that have halted executions over problems with lethal injection drugs are trying to figure out how to resume. Capital punishment remains legal in 31 states. Only five states conducted executions this year, the fewest number of states to do so since 1983. Georgia led the way with nine, followed by Texas with seven, two in Alabama and one each in Missouri and Florida. And just five states sentenced more than one person to death in 2016. California imposed nine death sentences, followed by five in Ohio, four in Texas, three in Alabama and two in Florida. But California hasn’t executed any of the 741 inmates on its death row since 2006 due to legal challenges over its lethal injection method. “As fewer states use the death penalty and as it’s used more sparingly in the states that do, we can expect long-term numbers to remain low and perhaps continue to drop,” Dunham said. So far, only Justice Ruth Bader Ginsburg has joined Breyer in questioning the constitutionality of the death penalty.